I’m a writer with a day job married to a musician with a day job. Free time for either of us is pretty rare. However, because the organisation I work for has a flexi time system, it does mean that if I build up enough hours I can occasionally take a day off work without having to use annual leave. Such days are useful for doctor and dentist appointments, and such, but they are also useful for dealing with domestic chores that require being at home on a weekday. So I generally try and schedule as many such tasks as possible for these days off. Friday this week was such a day, and although it was a completely unproductive writing day, on the domestic chores front we got quite a lot accomplished. First of all, we got the plumber round to replace the cracked plastic pipes on the side of the house that drain the water from the bath and the sink in the upstairs bathroom. Well, we thought the pipes were cracked. What we did not realise until the old pipes had been removed and the plumber showed them to us is that both of them had completely disintegrated on one side. Every time we’ve been running the water in the bathroom it must have been cascading down the side of the house. Just as well we got that fixed, then. While we had the plumber we also had him plumb the American fridge freezer we bought when we moved into the house in September into the water supply. So our fridge now dispenses ice cubes and cold water. I’ve got disproportionately excited about this. All weekend I’ve been drinking lots of glasses of water, just to have an excuse to fill up a glass with ice and water from the fridge. I also took the kittens to the vet to get neutered, since they have now reached five months and we cannot start letting our female felines outside until we can be assured they can’t get pregnant. I didn’t think this would be too much of an ordeal. Our last pair of cats were both female, and we had to get them done. However, these new kittens have very different personalities than our old cats. For starters, they are a lot more intelligent. With our former cats (who admittedly inherited pedigree genes) all we had to do to get them to vet was get the cat box and leave it on the floor with the door open. The cats would think “ooh! Box!” and would promptly go in because they loved boxes. Then I’d shut the door on them, as they belatedly realised they’d been foiled again. Not so with these cats. They have already learned to associate the box with unpleasantness and as soon as they saw it they were running to hide. I managed to grab one and shove her in the box, chased the second one for a while, but after catching her I opened the door to shove her in and the first one promptly escaped. Now I know the origin of that phrase “herding kittens”, used to describe the difficulty of getting a group of people in the same place at the same time. Eventually I did manage to get both cats in the box but not without injury. They came home after their spaying op safe and well. Unfortunately we have to go through the same fiasco on Monday, as I have to take them back to the vet for a post-op check. And I don’t have the luxury of a day off on Monday – it’s back to work for me. Which means after leaving work early to dash home in time, I’m probably going to be chasing the kittens around the house in my work clothes. And I will have a limited amount of time to get them into the box. This is a post all about our new kittens. Just to forewarn you. Just in case you don’t like cats, or something. When I blogged about putting my old cat Misha to sleep a few weeks ago, I’d already decided to get new cats. The house just felt too empty without them. We took our other cats from kittenhood to old age, and we decided we’d like to do the same to some more cats. There really needed to be two, to keep each other company, since we are generally out at work all day. We went through the Cats Protection League in the end. As it happened, they had plenty of kittens looking for homes – as it was June, it was possibly the right time of year. They dutifully sent someone round to check our home was suitable for cats. No problems there, since we have plenty of space and a good size garden. And thus we were sent to a CPL ‘foster mum’ who had kittens needing homes. The lady we saw was lovely, but was one of these people who seem to be better with cats than with people. The place was absolutely full of cats. About a dozen of them were hers – I gathered that she would adopt any cat who came through her care who did not find a new home. There were also lots of kittens, in cages. 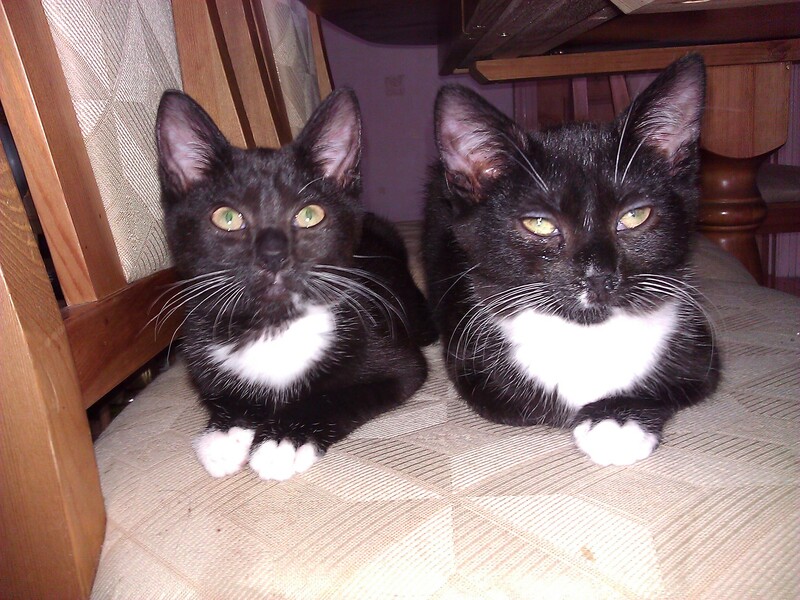 The two that immediately charmed us were a pair of black and white sisters, who were 12 weeks old. They seemed very laid back when we picked them up and stroked them, and seemed very friendly. We were told that they were the last two of a litter that had been abandoned at the police station. They were extremely nervous when we brought them home, and spent two days hiding behind Hubby’s guitar cases before they would come out. But eventually they got a bit braver, and started to explore their new home. They are both black, with white back paws and white patches on their chest. We have named them Alia and Cassie. Alia has a bigger white patch on her chest, and is a bigger kitten, though I imagine this situation will not remain as they get older, as Cassie is greedier and is now almost as big as her sister. We’ve had them about a month now, and they are four months old. They are very familiar with the house, and with us, and they are into everything. They chase each other around the house, climb up anything that’s static and chase anything that moves. They are particularly fond of chasing shoe laces – normally when you are trying to do them up. My last cats were old when they died, and spent most of their time sleeping. I had forgotten how active kittens can be. You have to be careful where you step, as they have this habit of following directly behind you, and you have to be careful what you leave lying around, as they’ll either play with it or try to eat it. They were rather timid when we first got them, but they have now got to be very friendly. They run and greet me when I come in from work, wanting strokes and cuddles. When other people visit the house they remark on how friendly the kittens are – they now seem very comfortable with visitors, and have worked out that if they come over looking all adorable, they’ll get some attention. The Cats Protection League are quite insistent that all kittens get neutered at the appropriate age, and that cats are not let out until they have been neuteured, to prevent unwanted kittens. I have no issue with this policy, and I have every intention of getting them neutered. But that can’t happen until they are five months old, and they are already trying very hard to get out. We have to be careful not to leave either the back or the front door open, as if they notice it they will make a run for it. The UK has been sweltering in a heatwave over the last three weeks. Not being able to open the back door to let some breeze in has been a tad inconvenient. We have instead been opening the windows, but now we have to be careful of that too, as Cassie has already got out through one of the upstairs ones. The window is right above the front porch. It seems she made her escape from the window to the porch, and then the porch to the ground. 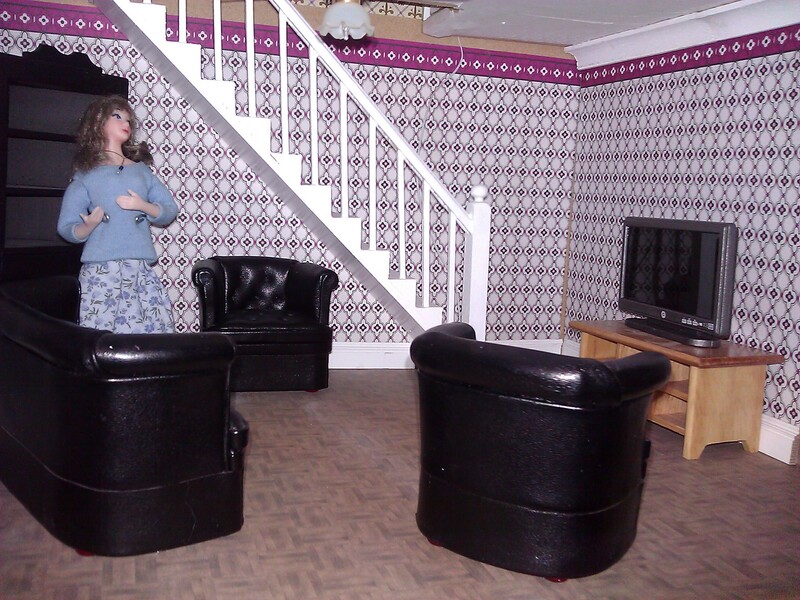 I spent ages hunting high and low before ascertaining she wasn’t in the house. I found her eventually under the car, looking rather terrified. It seems this kitten wanted to explore the world, and when she got there she decided that the world was big and scary. I had trouble persuading her to come out from under the car. In the end I had to entice her out with a plate of tuna, so I could grab her and bring her back inside (they are both very fond of all kinds of fish, we’ve worked out). She seemed no worse for wear for her little adventure, but I’m not sure she’s learned not to jump out of windows. Just in case, I’m now endeavouring to make sure they are open just a tiny crack, and not leave a space big enough for a kitten to squeeze through. 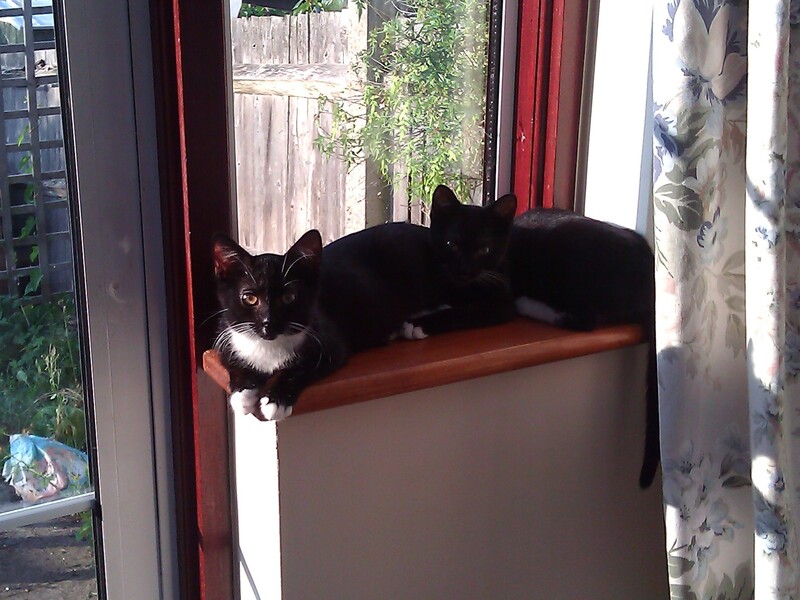 There will come a point when they will get too big to both squeeze onto this windowsill – currently a favourite spot. If anyone’s wondering about the names, we have a tradition of naming our cats after characters in current D&D games. These two kittens happen to both be named after magic users, but since they are mostly black, like witch’s cats, that seems appropriate. Alia is my character in one of the games we play. The more discerning geek might have remembered that Alia is the name of Paul Atreides’ mad sister in Frank Herbert’s DUNE. This is, of course, where I originally got the name from. We had to say goodbye to our last cat Misha yesterday. 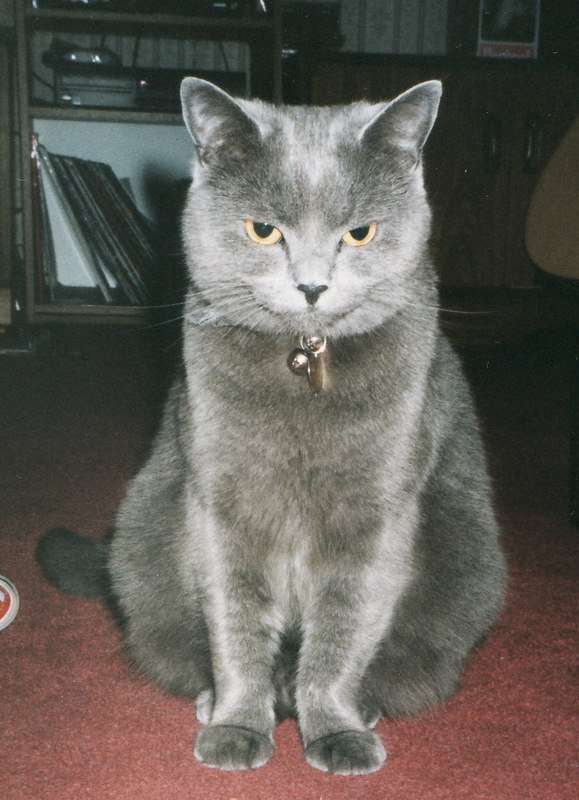 We lost her sister Misty in September of last year – two days before we moved house. We wondered at the time how Misha would cope alone, as the two of them had always been together. The house move probably helped all of us – we had too many things to do to dwell on the loss of Misty, and there were no memories of her in the new house. For a while Misha seemed a bit lonesome, but she seemed to settle quickly into the house. In fact she became a much more outgoing cat. It had always been Misty who had been the one to come down and socialise when we had visitors. After she died, Misha became much more sociable. But by the time Misty died Misha was old, and I always feared she was living on borrowed time. Most pedigree cats don’t live beyond 14. Misha was only half pedigree, but she was approaching her 17th birthday. It was about March I started to realise something was wrong. Misha was drinking an awful lot. She was drinking water wherever she could find it. Out of the glass I keep by the side of the bed at night. She was even drinking the filthy water from the pot Hubby washes his paint brushes in. I took her to the vet and was told she was in the early stages of kidney disease. Not uncommon in elderly cats, but sadly there is no cure. She was put on a prescription diet of low-protein food and I was told to bring her back in two months. Over the last few weeks, she had degenerated rapidly. She stopped eating, getting about seemed to be an effort, and it appeared she was unable to retain fluid. She would sit for hours with her face in her water bowl because she was feeling so dehydrated. Yet she would still jump in my lap and start purring when I stroked her. I took her back to the vet, who ran more blood tests. She rang me with the results on Thursday. Results were all off the scale, the vet said. The poor cat had so many toxins in her body she was unable to function normally. I was at my desk at work when the call came. I had to leave the office and find a quiet room to cry in. The problem with being a pet owner is that eventually you have to say goodbye. Knowing that Misha was suffering the only humane solution was to put her to sleep. To keep her alive without proper kidney function would probably mean she would die slowly and painfully from acute dehydration, or worse. Deciding to terminate her life was still one of the hardest things I’ve ever had to do, though. We took her to the vet for the final time yesterday – a Saturday. Because I couldn’t bear the thought of coming back home with an empty cat carrier, I carried her in my arms in the car, while Hubby drove. She’d never been in the car untethered before, and after a week of lethargy this new experience suddenly perked her up. Adrenaline, perhaps. I’m convinced she knew she was dying, and in her last couple of days she seemed calm, and accepting of her fate, even through the discomfort she was suffering. Misty died very suddenly. With Misha, we picked the time the end was to come. In some ways it was harder. There’s more time to cry. When I was growing up, we always had cats in the house, but Misty and Misha were the first two I had total responsibility for in my adult life. The first cats I took from kittenhood to old age. And now, for the first time in 17 years, I find myself living in a house without cats in it. It feels very strange. Filling the cat bowls with food and water is no longer a part of the morning routine. There are no plaintive ‘meows’ to greet me when I come in from work. No furry body leaping on my lap when I sit down to watch TV. I used to say that when my cats died I wouldn’t get any more – they are really not good for my asthma. But I am a Cat Lady, through and through. A house without cats just doesn’t feel like home. There will be more cats in the house before too long, I hope. But I will never forget my two fluffballs Misty and Misha. What do you do when you don’t know what to blog about? Take the ABC quiz. Thanks to Wonky Monkey, who posted this. Bed Size: King size. Though I have discovered that a king size bed is different in the UK and the US. Like a lot of things, in the States a King size is bigger. Chore You Hate: All of them. That’s why I have a cleaner. I’m a big believer in paying someone else to do the things you hate to do. Dogs? Don’t really like dogs. They are noisy and smelly and require walks every day. I’m much more a cat person – they are lower maintenance. Essential Start Your Day Item: I want to say a cup of tea. But to be more pragmatic, it’s my asthma inhaler, since I don’t get very far into the day if I’m wheezing like Darth Vader. Favourite Colour: Red. It’s always been red. I guess I like to be noticed. Gold or Silver? Silver. Especially necklaces. I am acquiring quite a collection of silver necklaces. Height: 5 foot 6 inches. More or less. Instruments You Play: Bass guitar, but I’m still a beginner. I used to play the clarinet, in school, but that’s going back a bit. Job: Whenever anyone asks me what I do, I have to qualify, “do you mean what I do or what I do for a living, because the answer will be different”. My vocation and my career is writing. But I don’t make any money at it, hence the need for a day job. So I work as an Executive Assistant for a medical college in London. Because I have a mortgage to pay I do my best to juggle the paying job with the non-paying one. It’s not always easy. Kids: None and no desire to have any. Live: 4 bedroom house in a suburb of South London. We moved in last year and I love the house. Still look forward to returning to it every evening, and have that moment of basking in happiness when I walk through the front door, in the knowledge that this is my home. Mum’s Name: Rosemary. But only my grandmother ever called her that. To everyone else, she’s always been Rosie. Nicknames: None. At least none that I know of. It’s possible that there are some that people call me behind my back, but I’ve no desire to know what they are. Overnight Hospital Stays? I had my tonsils out, age 6. Because my parents didn’t want me to be afraid, they’d prepped me by telling me that hospital was a fun place to be. Apart from the rather sore throat afterwards, I had quite a good time. More recently I’ve had to go in for haemorrhoid removal. That was really not fun – in fact, I wouldn’t wish it on anyone. Pet Peeve: Smokers. Especially those that light up when they are walking down the street in front of me, and I get a face full of their smoke. My asthmatic lungs really do not appreciate this. Quote from a Movie: Lando Calrissian from The Empire Strikes Back – “I’m responsible these days. It’s the price you pay for being successful.” How true that is. Right or Left Handed? Left handed. Everyone in my immediate family is right handed and they never really got how awkward being left handed in a right handed world can be. I used to get told off for putting the knives and forks the wrong way round when I set the table as a kid. Siblings: Two sisters, both younger. My overdeveloped sense of responsibility comes from being the eldest child. Time You Wake Up? When the alarm goes off. On an ordinary working day, this is 6:00 am. If I want to do some writing first, it’s 5:30 am. On weekends, when I don’t have to set the alarm, I sleep for as long as possible. Generally till about 10:00 am. I need 8 hours of sleep a night and I never get it. I’m permanently in a state of sleep deprivation. Underwear: Cotton bikini briefs. Generally in five-packs from Marks & Spencer. Comfort first. Vegetable You Dislike: All of them. Vegetables are like exercise – not pleasant but you have to have them because they’re good for you. I will tolerate peas, cauliflower, carrots, green beans, mange tout and sweet corn. Most of the rest I won’t eat. What Makes You Run Late: My husband. I’m always ready half an hour before we need to leave. He doesn’t like to be the first person to arrive, so we’re always fashionably late to everything. X-Rays You’ve Had Done: Ankle, when I fell on it whilst paintballing. Turned out to be sprained, not broken, however. Skull, when I fell at the tube station and cracked my head. I got concussion, but no fracture. Numerous chest x-rays when my persistent and alarming cough worries the doctor. They revealed nothing untoward in my lungs apart from the fact I have asthma. In spite of being accident prone, I’ve never broken a bone. So far. Yummy Food You Make: I’m not a cook, but I do occasionally bake, and I can make fabulous peanut butter cookies. Zoo Animal: Probably the giraffe. I find it fascinating that such an awkward-looking animal evolved naturally. They can’t lie down for fear of breaking their long necks. And yet I’ve seen them in their natural habitat, traversing across the Serengetti, where they manage to look incredibly majestic. And there we have it – 26 fascinating (or not) facts revealed in the ABC quiz. What would your answers be? This is my cat Misty, who died on 16 September 2012. She and her sister, Misha, were born on 1 August 1996. 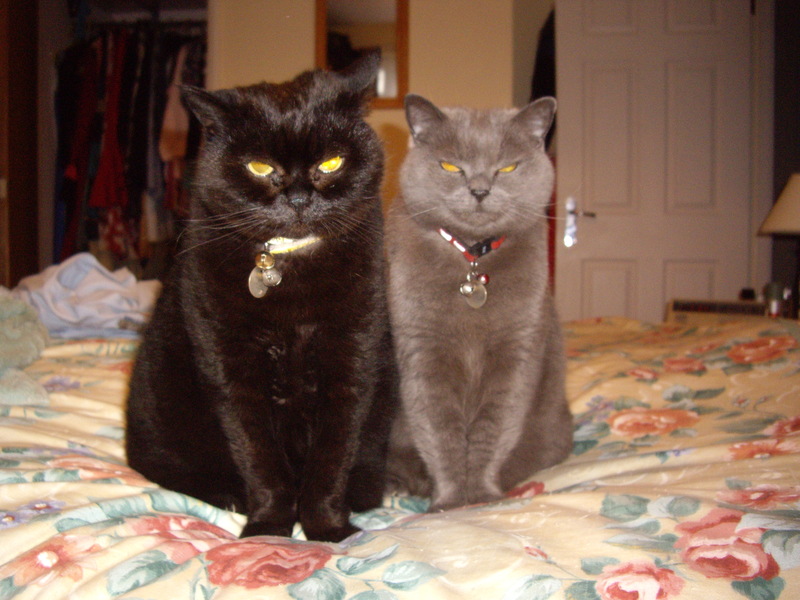 Their mother was a pedigree chocolate point British shorthair who belonged to a colleague of my husband’s. This particular cat, though being very well-bred, obviously fancied a bit of rough as she escaped one night and went out looking for some mongrel action. She must have had herself a good time, because she came back pregnant. She gave birth to a litter of five kittens. One of them was a beautiful British blue – exactly the same colour as her uncle, another pedigree (also owned by Hubby’s colleague). Two of them were black, and the other two were a random tabby colour – possibly an indication of the mongrel tom who fathered the kittens. We’d just moved from our flat into a maisonette, and since we now had a front door of our own, that could be used for feline egress, we decided the time was right to get a cat. In fact we decided to get two – since we were both out all day, we thought two cats from the same litter would keep each other company. We went to see this new litter of kittens, and we picked two. 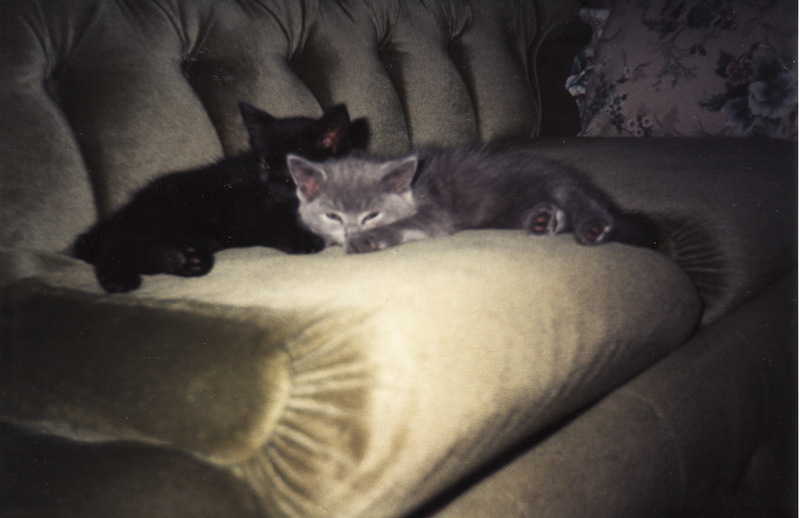 We had the British blue, which we named Misty, and one of the black kittens, which we called Misha. When they came to us they were about nine weeks old – adorable little bundles of fluff. Being half pedigree, these cats had been born with generations of the inclination to do nothing but sit around on cushions looking pretty bred into them. They were always rather lazy, even for cats, and both got rather fat as they got older. They were also not exactly at the top of the feline IQ chart – generations of inbreeding tends to make pedigrees rather less bright than moggies. But they both had a very gentle nature, and were very sweet cats. Misty had a thing for boxes. Every time something new came into the house, she was there waiting for us to unpack the box so she could squeeze into it. Even if she was too big and the box too small, she would try to squeeze into it anyway. She was particularly fond of hubby’s guitar cases, which had the added advantage of being felt lined, so more comfortable than regular cardboard boxes. She liked to sit in the bathroom when I was taking a bath. The first few times she did this, as a kitten, she would sit on the side of the bath with her tale hanging down into the water. The fact that it would be getting wet appeared not to phase her. Once, she tried to jump on me while I was in the bath. I saw her sizing this up for a while, and then she took a flying leap off the side into the water. She hit the water, yowled, turned around in mid-air and shot back out again, before shooting out of the room. This all happened in one movement, and was rather amusing to watch. Suffice to say she never tried to jump in the bath again. She would instead come in and sit on the bath mat while I was bathing. 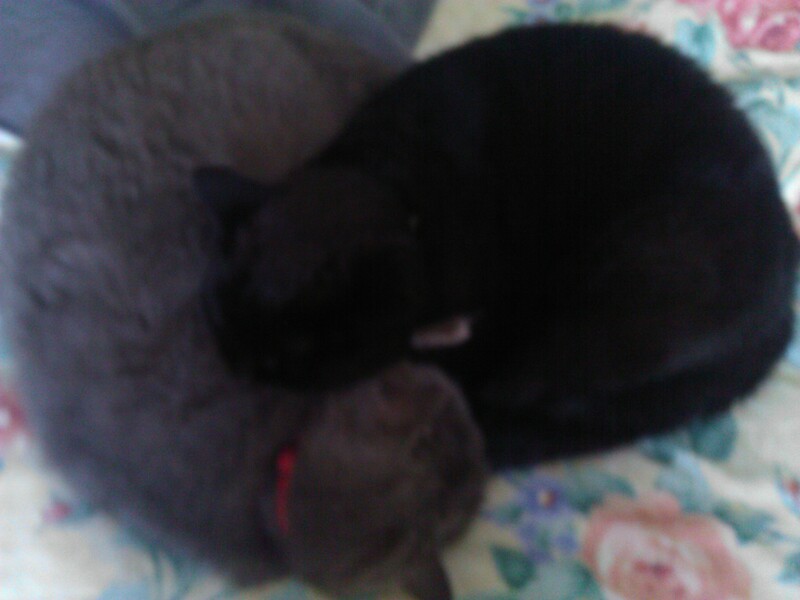 Misty and Misha spent all their lives together, and right to the end they would curl up and sleep together. But over the last few years I was aware that as cats they were past the expected life span, and would not be with us for much longer. In the summer I took Misty to the vet, who confirmed that she had lost quite a lot of weight – a kilogram in the last 12 months, specifically. The vet offered tests to find out what was wrong. I declined at the time. Misty seemed quite happy – she was still jumping up and purring. She wasn’t eating as much, but she’d been a very fat cat to begin with, and she didn’t appear to be in pain, or particularly miserable. Two days before we moved, she came down the stairs vomiting blood, and we had to take her to the emergency vet surgery (it was a Sunday – the usual surgery was closed). She died on the way there. It turned out she had a throat tumour. If we’d have had the tests, we might have found out about the tumour, but it was untreatable, so we could not have done anything about it. All we could have done was wait for her to die. In the end, she died in my arms, which is probably the way she would have wanted to go. Sometimes I feel bad that I didn’t do the tests and find out earlier what was wrong. Partly it was because I think I didn’t really want to know. But the other part is I didn’t think it was fair to subject a 16-year-old cat to tests and treatments that were going to be painful and distressing. In the end she got to spend the last few months of her life at home, in comfort, with the humans she knew and loved. The end, when it came, was sad, but it was all over quite quickly. In retrospect, I am convinced that Misty knew she was going to die. The night before she’d been unusually active, coming down to talk to us and our guests and visiting favourite spots she hadn’t been to in a while, like the windowsill. I think she was saying goodbye. It seems Misha knew it, too. We took her on that final journey to the vet, because we knew at that point Misty wasn’t coming back, and we wanted to make sure Misha understood that. Misha has settled into the new house well. I think she’s a bit lonesome, but she’s accepted the fact she’s now the only cat in the household. And the vet says she’s surprisingly healthy for an old fat cat, so hopefully she’ll be with us a bit longer. I think perhaps moving to a new house immediately afterwards helped all of us. It made a stressful situation even more stressful, but we’re in a new place where there are no memories of Misty. She was with us for 16 years, and I think she had a happy – if lazy – life with us. Losing a pet is always hard, as they become part of the family, but we can remember the happiness they brought us. Goodbye, Misty. You were a special cat, and I will always remember you. I encountered an upsetting sight on my way to the sports centre for my Sunday morning swim this morning. There was a dead cat lying by the road. I actually recognised the cat – I have seen it dashing across that road quite often. I guess it used up all of its nine lives doing so. When I got home I sought out my cats, to find them curled up asleep on the bed – which is where they had been when I left them. I took this picture of them. I guess there’s an advantage to having fat lazy cats who sleep all day and show little inclination to venture outside – they are less likely to get run over. I don’t know who the unfortunate cat belongs to, but some family’s going to be very upset when they find out what happened to their pet. Urban roads are hazardous places for family pets. I am quite glad my cats prefer the indoors. Yesterday I had a day off to do those things I don’t get time to do when I am at work all day. First errand of the day was to go to the doctor’s surgery to get my annual flu vaccination. This is offered to me free of charge every year because having asthma puts me in a ‘high risk’ category. I normally get a letter in early October asking me to make an appointment at the flu clinic. I hadn’t had a letter so I rang the surgery, asking if flu jabs were available yet. “We’ve sent out the letter”, the reception told me. I explained that I hadn’t had a letter. “Do you normally get a flu jab?” she asked. I replied that I did, suppressing the urge to add that I wouldn’t be phoning otherwise. “Then you’ll get a letter,” the receptionist went on. She took my name and went off to check my records and some time later came back and said, “you have asthma. That means you can get the flu jab.” I think my doctor ought to start offering a higher salary when he advertises receptionist jobs. But I did get my appointment, and when I turned up to see the nurse, she also offered me a vaccination against pneumonia. In the other arm. 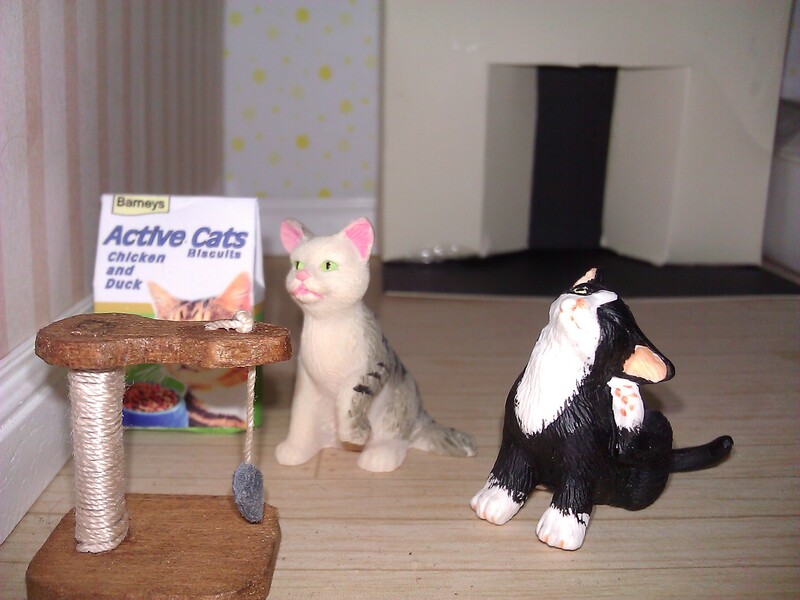 I had also arranged an appointment to take my cats off to have their annual boosters later that day. My cats are big, fat, lazy things, as I’ve mentioned before. And they now know what the cat carrier means. They will let me pick them up without objection, but when I try to put them in the carrier, they do the old – ‘rigid paws clutching either side of opening’ trick. With both cats eventually locked in the carrier, I heaved said carrier out to the car. And I do mean ‘heaved’. I’ve always put both cats in one carrier – I figure it’s less traumatic for them that way. But they are now far too heavy for this. I think I’m going to have to invest in another carrier, and carry one in each hand. It might actually balance me out a bit and be easier to carry. The vet’s surgery isn’t far away, but parking anywhere near the surgery is always hit-and-miss. Yesterday it was a ‘miss’. In fact the traffic was a bit of a nightmare. I had to park around the block, meaning I had to lug the carrier quite a long way before arriving at the vet’s surgery. Once the carrier is deposited on the vet’s table, getting the cats out of it so the vet can look at them is another ordeal. Before now I’ve resorted to tipping the thing upside down and waiting for one or both cats to fall out. “Your cats are adorable, but they are both far too fat,” the young vet said cheerfully. She was lovely, but she looked about sixteen. I explained that with my cats being half pedigree, and getting old, they aren’t too interested these days in doing much apart from lying about sleeping. Not that I blame them for that. I quite fancy that sort of life myself. But I do have to acknowledge the fact I have two fat cats. The vet suggested I merely give them less food. Not being very active, they don’t need to eat much. Of course, I’m not sure I can explain this to them. 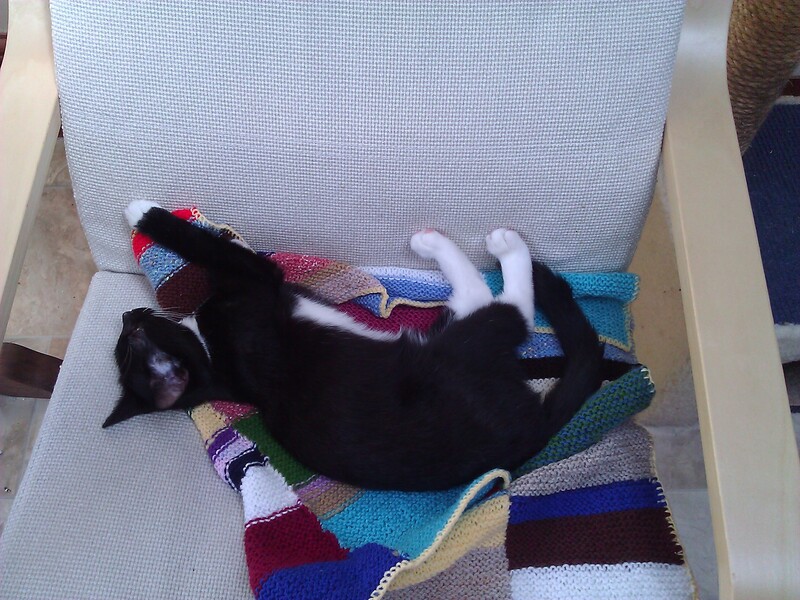 In spite of their protests, the cats are not remotely traumatised by their vaccinations. I, on the other hand, have two extremely stiff arms, where each needle went in and pierced muscle that was probably already tense, because I hate needles. I suspect the strain on the arm muscles of having to lug two overweight cats half a mile down the road right after the piercing trauma did not help this situation. I think the lesson learned in this little adventure is not to arrange a trip to the vets after I’ve had my own vaccinations. It’s going to be another couple of days before I can move my arms again. 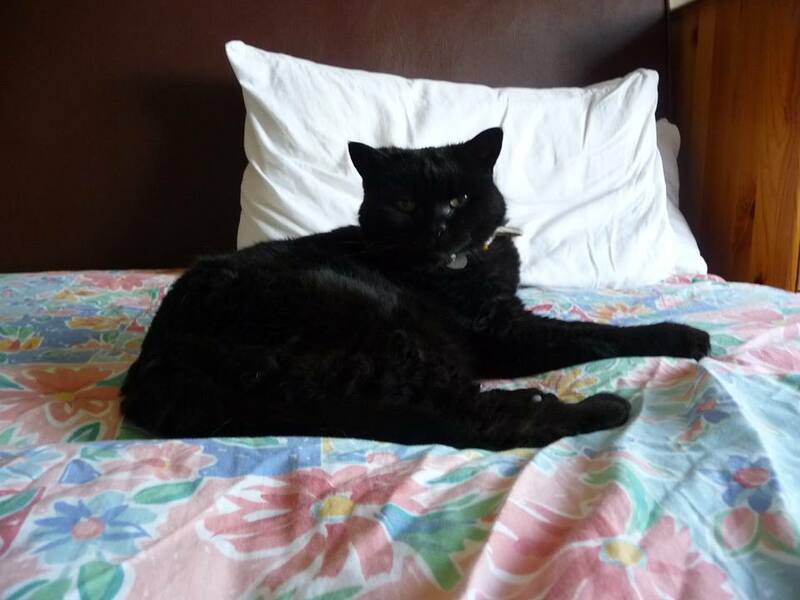 My two elderly cats are half-pedigree (Mother was a chocolate point British shorthair who got out for a bit of action with the mongrel toms one night), and age and breeding makes them inclined to remarkable laziness – even for cats. The only time they get any exercise is when they move from one favourite sleeping spot to another. Misty – the British Blue – has a fixation with boxes. Misha, the black cat, isn’t quite so bothered. 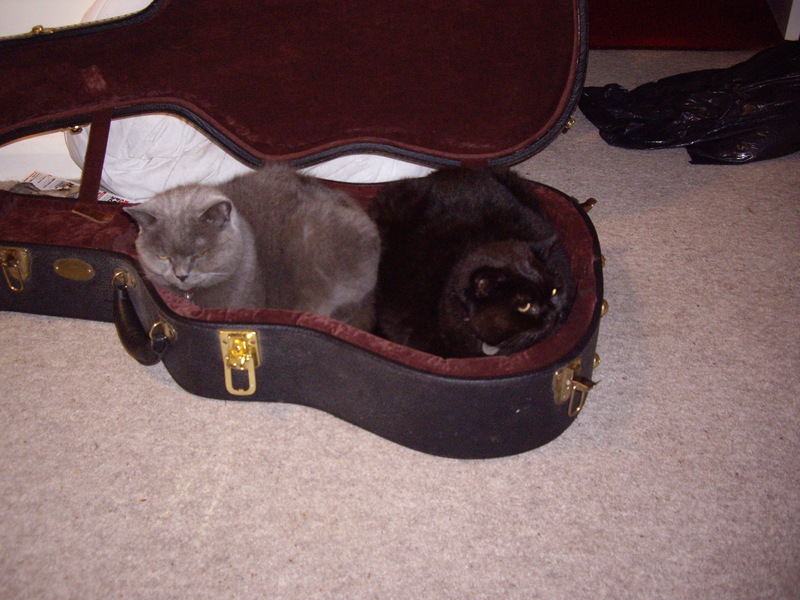 The other day, however, they both decided that Hubby’s guitar case was a fine place to sleep, and they spent several hours there. We thought it was very cute, and we took a picture. My cats eat too much, throw up all over the place, scratch the leather sofa and sit on the top of the stairs, in the dark, making one inclined to go flying. But then they do things like this and I remember why I have them. Aww. I’m having a busy old time at the moment. The bi-annual formal dinner I organise for work is on Friday, and the run-up to it is always hectic. The week after that, we’re off to Canada. As we know so many people there, I’ve been firing off emails to various people to find out who’s free to meet up with us and when as part of the trip organisation. Hubby has spent the best part of the last two weeks working abroad, and when he comes back he’ll have to pack his suitcase for Canada. In fact, I think sitting at the airport waiting for the plane will be the first chance I get to have an extended conversation with him in three weeks. But because he’s not been here, I’ve also had to run errands on his behalf. Taking his suits to the dry cleaners so he has something to wear to the office when he’s back. Sorting out the tax disk for his car, which expires while we’re away. Booking an appointment for a hair cut for him, so he can get it done in the day or so he’s in the UK between flights. And I’m still being diligent in getting up at 5:30am twice a week to get my ‘writing mornings’ in. But in spite of all this, I’m not feeling stressed (rather exhausted, perhaps, but not stressed). After a cold winter and unusually cold May, it seems the warm weather has finally arrived in London. I love Spring. Getting up at 5:30am is not so bad at the moment because it’s broad daylight at that time in the morning. I love the extended days we get at this time of year, this far North of the equator. 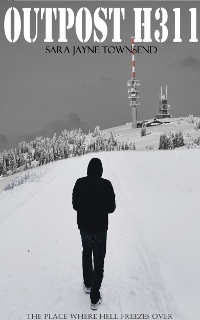 We pay the price with excessive hours of darkness in winter, but winter’s a long way off. And there’s tonight. Tonight I have nowhere in particular to be – for the first time in ages. I have no urgent emails to send, no documents to hunt out, nothing important to do. So just for tonight, I am going to do nothing. I am going to be on the sofa with the cats, in my PJs by 9pm, watching ‘Supernatural’. And then ‘Dexter’. From tomorrow, I’m busy until July. But that’s tomorrow. Tonight, I’m spending quality time with the Winchester boys. Bliss.